In February 2012, the commercial satellite industry and the U.S. Government marked the one year anniversary of the first award under the Future Commercial SATCOM Services Acquisition, or FCSA. The initial intent of the joint GSA-DISA vehicle was to create a common marketplace for government customers to increase competition, opportunities and technologies, and ultimately, provide competitive pricing to the government. 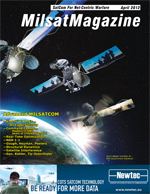 As industry awaits the third tier of the FCSA suite, the custom satellite solutions or CS2 contract, MilsatMagazine spoke with SES Government Solutions President and CEO, Tip Osterthaler, to obtain his feedback on the Transponded Capacity and Subscription Services contracts released during this first year of FCSA. Tip, from the perspective of a commercial satellite operator, how was the new FCSA model different from the previous way of doing business? What was this recent change intended to do? For the past decade, the Department of Defense procured a large portion of their satellite communications capability through a procurement vehicle known as DSTS-G, which stands for the DISN Satellite Transmission ServicesGlobal. When initially awarded to three small businesses in 2001, DSTS-G was the single largest small business set aside procurement of its kind in DoD history. In 2011, the FCSA vehicle opened the competitive landscape to include commercial satellite operators, integrators, equipment manufacturers, and service providers. This broadening of the participants in the GSA schedule enabled direct dialogue between the commercial satellite operators and the government end-users, and was intended to foster competition, increase options for the government, and reduce costs. SES Government Solutions was one of the first satellite operators to receive the new FCSA vehicle under Schedule 70 in early 2011. How would you say SES-GS was positioned when the first opportunities came out for competition considering your foreign ownership? Weve been doing business with the U.S. Government for over 35 years, since signing our first contract with the Air Force in 1975 as RCA Americom, and even during the DSTS-G era, we provided satellite services and solutions directly to the government under a number of different contract vehicles. As a U.S. proxy corporation and wholly owned subsidiary of the Luxembourg-based SES, we operate as an American company, so foreign ownership is not really an issue, particularly in light of the fact that there are no large American fixed satellite service companies. Having said all that, the DSTS-G contract limited our direct interaction with the Government and specifically some of the most important end-users of our services, so we are still in the process of rebuilding those relationships. Following the first year of FCSA, do you believe the government is in a better position to receive the competitive pricing and common marketplace they initially were seeking? Do you support this new way of doing business with the government going forward? At SES-GS, we continue to strongly support the Governments move toward a more open and inclusive procurement environment for commercial space products and we also strongly support the initial intent of the FCSA program. However, for more than 10 years, commercial satellite capacity was channeled through three small companies, and the traditions and relationships that developed over those years are deeply entrenched. I would have to say that, so far, FCSA has not lived up to its promise. To truly take advantage of the competitive landscape now available to the government, it will take more than a new contracting vehicle. I regularly meet with DISA and other government officials, and I believe they are committed to making FCSA a success. However, as long as end-users are permitted to write requirements that can be met by only the incumbent solution or a single service provider, the benefits of competition promised by FCSA will not be realized by the government. Are you suggesting the first year of FCSA was essentially, business as usual in terms of the previous DSTS-G program? If so, how? We understand that a change this significant will take time to have its complete and intended impact. This is after all the largest SATCOM procurement program to date for the U.S. Government. However, since the first contracts were released in February of 2011, almost all of the awards have been made to the incumbents, either as a recompete on FCSA or as an extension of existing work on DSTS-G. Continuing in this fashion does not get the government in the position of increased competition and affordable solutions they were initially seeking. Unfortunately, early indications reveal similar results in year two of the procurement process. Is there substantial risk to continuing to procure capacity in this fashion going forward? If so, what is the risk and what would you recommend the government do? The U.S. Government and, particularly, troops deployed in the CENTCOM AOR will be dependent upon commercial satellite capacity for the foreseeable future, and this reality makes it very important that commercial owner-operators like SES remain engaged and focused on the needs of this customer. I believe that DISA is doing what it can to create a level playing field for companies like ours who are reentering the direct market, but, so far, the expectations they have created over the past three years are simply not being met. We remain hopeful that, over time, the market will indeed be more open to new providers and solutions. However, every day that passes without real competition increases the risk that FCSA will not deliver more choices or lower costs, but instead cause companies such as ours to have to take a wait and see attitude rather than relying on what the government says it intends to do. This would be a very bad outcome for both the government and our company, because we simply do not have enough money in the DoD budget to buy the space capabilities we need if we continue to do business the way we have done it in the past. Mr. Robert Tipton (Tip) Osterthaler joined SES in 2006 to become the President and CEO of AMERICOM Government Services. Since then, the wholly-owned subsidiary of SES SA has become SES Government Solutions (SES-GS). During his tenure at SES, the U.S. Government business has been transformed from a product-oriented sales channel into a solutions-focused independent subsidiary responsible for all aspects of SESs U.S. Government business, including planning for the next generation of satellites that will be needed by government users. Under his leadership, SES Government Solutions transitioned into a Proxy Corporation structure, allowing the company to broaden its business base to include a wider range of customers and technologies. In 2008, SES-GS entered into a groundbreaking contract with the U.S. Air Force to fly the Commercially Hosted Infra Red Payload (CHIRP), and in 2009, SES-GS conducted its first acquisition, enabling the company to better serve the intelligence community. From 1997 until 2006, Tip was a Senior Vice President at Science Applications International Corporation (SAIC). His last assignment was Deputy General Manager of the Strategies, Simulation and Training Business Unit, a 2,300 person organization that provides government and commercial clients with advanced modeling, simulation and training solutions. Prior to joining SAIC, Tip served in the U.S. Air Force for 28 years, retiring as a Brigadier General and Deputy Assistant Secretary of Defense for European and NATO Policy. Earlier positions include Vice Commander of the Air Intelligence Agency and numerous command and senior staff assignments. Mr. Osterthaler is a Command Pilot with more than 3,200 hours of flying time in fighter aircraft including multiple models of the F-15 Eagle.